The start of the holiday season means that things get a little nuts around here. People want websites and greeting cards so I’m spending more time designing, cutting paper and packaging orders than making sure my meals are “blog worthy”. 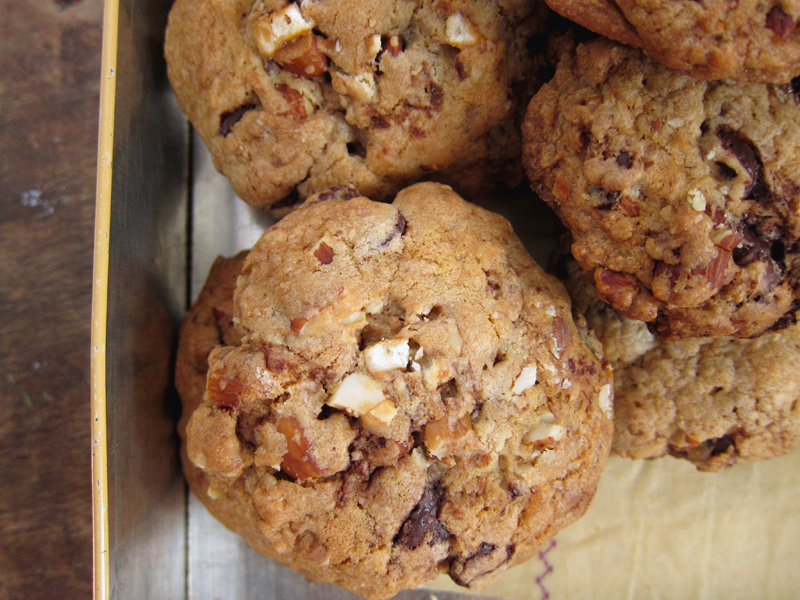 I hope you’ll forgive me because I’m talking about cookies today. 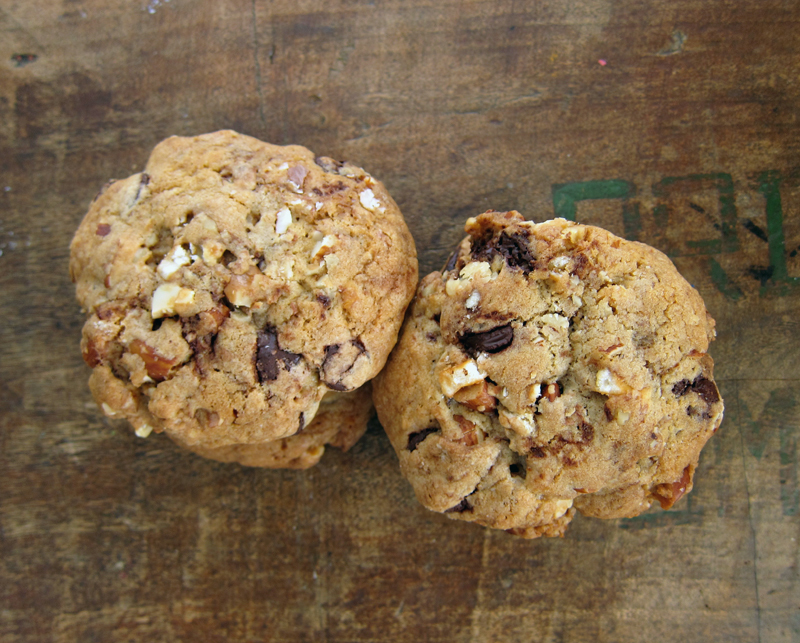 And not just any cookies, nut job cookies – except I like to call them nut jobbers because it’s funner to say out loud. 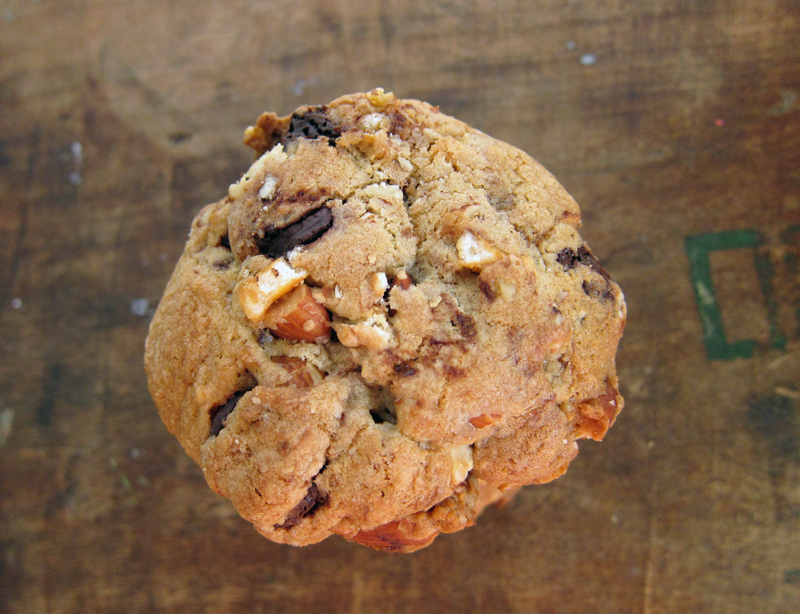 But if you like tons of nuts and dark chocolate stuffed into a big crisp and chewy cookie, well, I’ve got your cookie needs covered. Make way for the almighty nut jobber. This cookie comes from one of my favourite baking books, Piece of Cake: Home Baking Made Simple . When I first heard of this book earlier this year, I made a batch of colourful sugar saucers and loved them so much I ran out and bought the book. 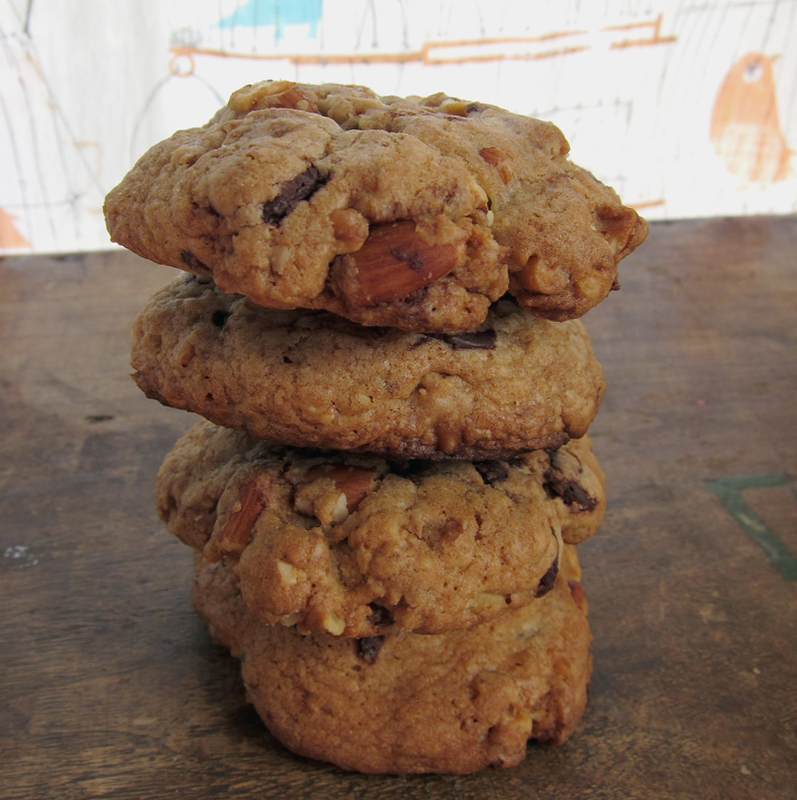 But then I made the nut jobbers and my husband declared them his new favourite cookie. His previous love, these oatmeal pumpkin chocolate chip cookies, were bumped into second place. The original recipe called for pecans, macadamias, walnuts and almonds. But macadamias are spendy and I didn’t have any on hand, so I subbed in some good quality dark chocolate chips instead. No harm done. But if I ever have macadamia nuts, I’m going to try this cookie chocolate-free, just to taste the difference. The nuts get toasted in the oven which brings out their richness and just makes them taste a hundred times better…so don’t skip this step. I hope you enjoy the cookies as much as we did. And to thank you for reading, I’m offering a little discount to my card shop on etsy: 15% off all orders! Holiday cards, birthday calendars, gift tags, the works! Just use the code NUTJOBBERS at checkout for 15% your order (but hurry, it expires November 18th!). Make some cookies, put your feet up and send out a couple cute cards to your favourite people. Thanks for reading, commenting & sending me lovely emails, it makes these busy times extra sweet. Preheat oven to 350F. Line 2 baking sheets with parchment or silpat and add nuts evenly on a single layer. Toast for 8-10 minutes or until lightly brown and fragrant. Remove the nuts from the trays and let cool for at least 5 minutes. Keep the silpat or parchment handy, you’ll use them later to bake the cookies. Using an electric mixer, cream butter and both sugars on medium-high speed for 1 minute. Add in the eggs one at a time, beating well between each egg. Stir in the vanilla and almond extracts, scraping the bottom of the bowl and then beating again to get the batter to a consistent mix. On low speed, slowly add in the flour mixture and continue mixing only until the flour disappears. Fold in the nuts and the chocolate chips – the batter will be stiff so you’ll get a real workout! Use a tablespoon (or an ice cream scoop if you want large cookies) and drop the mixture onto the prepared cookie sheets, spacing 2″ between each cookie. Bake cookies for 12-14 minutes for small cookies and 15-20 minutes for large cookies. They’ll appear golden brown around the edges and appear cooked in the middle with some give when touched. Cool on baking sheets for 10 minutes before moving to cooling racks. Cool completely. Makes 8 large cookies or 24 regular sized cookies. So many nuts in one cookie!! I’m sure that makes them extra tasty. Thanks Joanne, all those nuts do make it extra special. Your cards are so dang cute! I never have macadamias just lying around, either, ha. I do love a good nutty cookie! Thanks Nicole 🙂 Who has macadamias laying around? No one. 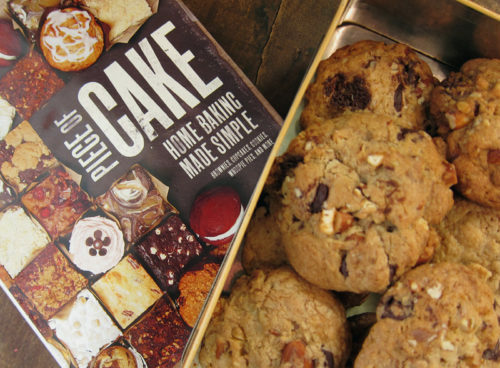 These look like all of the wonderful things I love all wrapped up in one cookie! Can’t wait to try them. These look so good…nice and chunky! The only time I would ever have macadamias lying around is if someone just returned from Hawaii…and then it is hard to say if those fat bombs would make it long enough to make cookies! These look really good. Love the combination of ingredients. My wife has got to see this recipe. Look forward to trying them. Thanks. I know, Hag, a spendy nut to have around and I’d eat them up before I could bake with them too. These were great without them. I love the way you think, RMW! I don’t really know what went wrong with mine! In the end my final dough wasn’t stiff at all. It was very soft and kept sticking to my hands (I couldn’t even make little balls with it) so I kept adding flour until I could. I think this might have been my mistake! I will try again soon! Maria, your butter may have been too soft. Next time, don’t add in extra flour – instead, let the dough stiffen up in the fridge for 30 minutes or so. I tried these cookies and was pleasantly surprised. I substituted 1 cup of nut with raisins and dried cherries and the results were delicious. Even my husband (who really only likes chocolate chip cookies) loved them and begged me to make more. Yummy!